It’s taken many of us several days to figure out what happened in Tuesday’s election — which has to rate as one of the most astounding results in presidential history. So it may not be fair to now ask you to try and figure out who these “unknown” campaign buttons are for. Thus far, we’ve completed the first 12 letters of the alphabet. (Check out our previous “Who Dats”: Unknowns beginning with the Letter A, Letter B, two pages for Letter C (here and here), Letter D, Letter E, Letter F, Letter G, Letter H, Letter I, Letter J, Letter K and Letter L.) We even have one of buttons with pictures only — no names. That’s even harder to decipher. ROW 2 — Mendelsohn (button 5) may be Queens, N.Y., 1954. 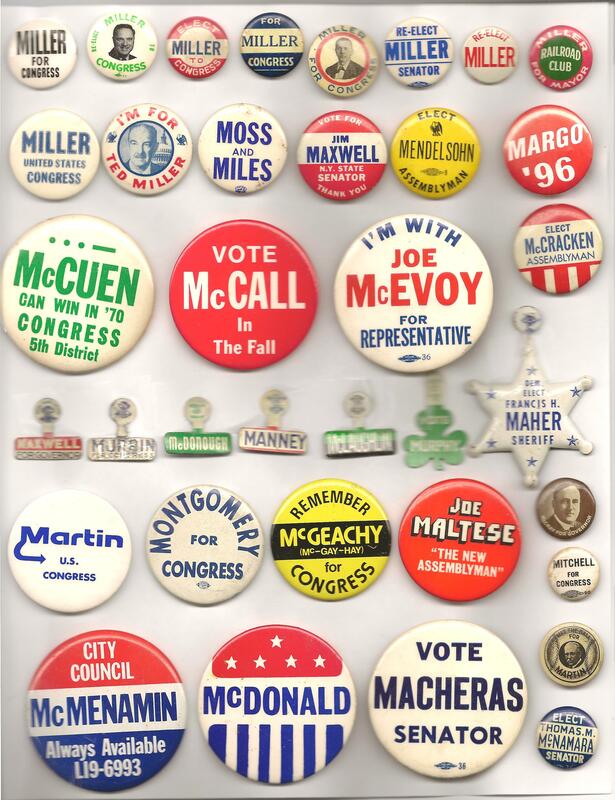 ROW 9 — “For Congress/Labor Choice/Francis M. McInerney 13th District.” May be from N.J.
ROW 10 — Right under the McInerney button is one that reads “National Vice President” with “Maddox” on a map of Iowa. ROW 20 — Jeanne McKalip may be from Illinois. ROW 23 — “Chuck McIlhinney” is from Pennsylvania. “Elect Moylan Judge” may be from Florida. “Martel” has a N.H. address on the curl. The McCray for governor item was used by Warren T. McCray, was from Indiana, and ran in the 1916 Democratic primary, and has the Republican nominee in 1920. Row 22: “Republican Mills Lt Governor” is Iowan Max Milo Mills (1920-1998), who was an Iowa State Republican Senator who ran for Lt Governor in 1966. Row 16:”MIN Lt. Gov.” is Minnette Doderer (1923-2005), a Democrat who served in the Iowa House of Representatives and was the first woman to run for the Lt Governor position in 1970 (and once again in 1978). Both of these items are in my collection. Would “McCall” perhaps be H. Carl McCall, who was elected to the offices of New York State Senator and NYS Comptroller, prior to his 2002 run for Governor? Charles Mulcrone was from Mackinac County, Michigan (City Treasurer (D) of St. Ignace). “Mandich for Mayor” — likely Peter Mandich, Democrat, elected mayor of Gary, Indiana in 1951 and 1955, serving 1952-58; resigned in 1958 to run for Lake /county sheriff; indicted in 1962 on Federal tax charges, but acquitted. “Republican Mills Lt. Governor” — Perhaps Max Milo Mills of Iowa. He ran for this office twice, winning the GOP primary in 1966 (but losing the general), and losing the primary in 1968 to future U.S. Senator Roger Jepsen. “Elect Mucci Representative’ — In 1946, Col. Henry Mucci, a war hero who liberated a Japanese POW camp, was the Democratic nominee for U.S. Representative from Bridgeport, Conn. He lost to John Davis Lodge, the brother of Henry Cabot Lodge and a future Governor and Ambassador. (See Stephen Hess, America’s Political Dynasties: From Adams to Clinton, pp. 479-80.) Is this button old enough to be from 1946, though? “Remember McGeachey for Congress” — State Rep. Hector McGeachey ran in the Democratic primary in North Carolina 7 in 1972, losing the runoff to Charlie Rose. See Barone, Ujifusa, and Matthews, The Almanac of American Politics 1974, at p. 755. “Re-Elect Miller to Congress” (top row of page 1) — The picture looks to me like Clement W. Miller (D-CA), congressman 1959-62 and author of Member of the House: Letters of a Congressman, who died in a plane crash in 1962. “Elect Madonick to Congress” — Carl Madonick was the GOP nominee in New York 21 in 1958, losing to Herbert Zelenko. See Congressional Quarterly, Congressional Elections 1946-1996, p. 224. Daniel, every source I have says that the Republican who ran against Zelenko in 1958 was “Medonick” not “Madonick,” which is the button in question. “Elect McMorrow Mayor” — John P. McMorrow, a member of the ?Boston /school /committee, ran for mayor in 1959, coming in last in a primary field of five. See Murray Levin, The Alienated Voter: Politics in Boston(1960), pp. 8-9 and 15. The red “McGee” button on p. 2 — I actually own one of these. 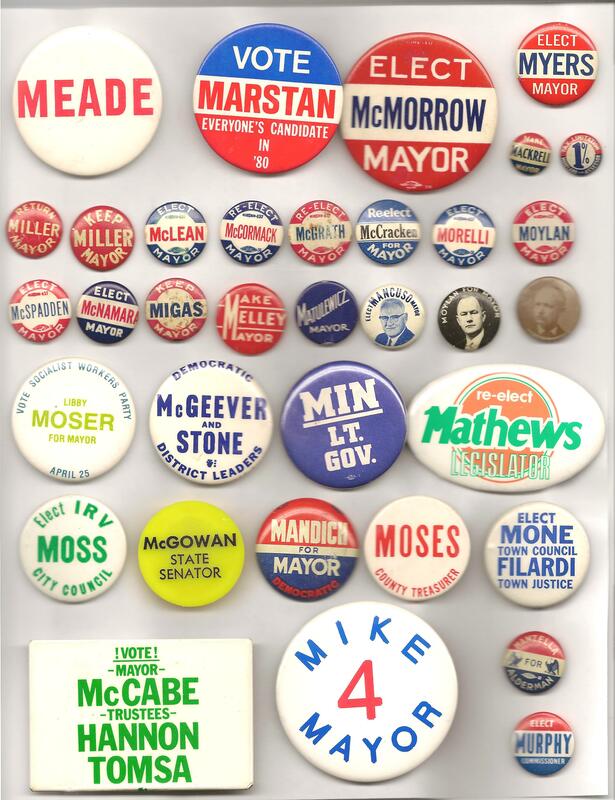 I bought it at a flea market in Springfield, Ohio, which is near Dayton, and the dealer I got it from had a lot of Dayton/Montgomery County campaign buttons. For this reason, I believe the button is for James H. McGee, Dayton’s first black mayor, who served 1970-81. Is Joe Maltese any relation to Serphin Maltese, the Republican-Conservative state senator from Queens? 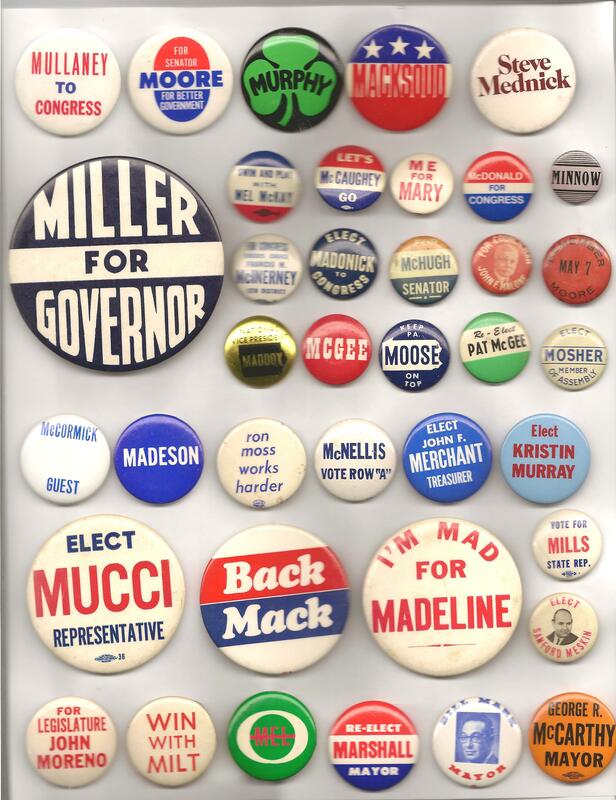 I can’t pin it down any further, but I think the “Jo” Malmsten button (page 4, row 3) is from a state legislative race in Hennepin County, Minnesota. 1. A Mrs. Jo Malmsten lived in Minneapolis (see Life magazine, 5/20/57), which is in Hennepin County. I have not been able to determine Mrs. Malmsten’s party or the year she ran. “Murrin for Congress” tab – Probably Pennsylvania 11, 1936 or 1938. James B. Murrin, a former mayor of Carbondale, PA, challenged incumbent Patrick J. Boland in the 1936 Democratic primary in Pennsylvania 11 (Scranton) with the endorsement of Father Coughlin’s organization. After losing, he ran as an independent on the ticket of the Royal Oak Party (the Pennsylvania name for the Coughlin-backed Union party). See Philadelphia Inquirer, “Primary Opponent Stands by Owens in Congress Race,” 5/10/36, pg. 20, and “Lemke Petitions Filed at Capitol,” 9/3/36, pg. 7 (available here: http://www.fultonhistory.com/fulton.html ). “I’m a Merson Person” – Possibly Alan Merson? This antiwar, environmentalist candidate ended Wayne Aspinall’s congressional career by upsetting him in the Colorado 4 Democratic primary in 1972, He went on to lose the general to Republican James P. Johnson. See Barone, Ujifusa, and Matthews, The Almanac of American Politics 1974, pp. 160-161. 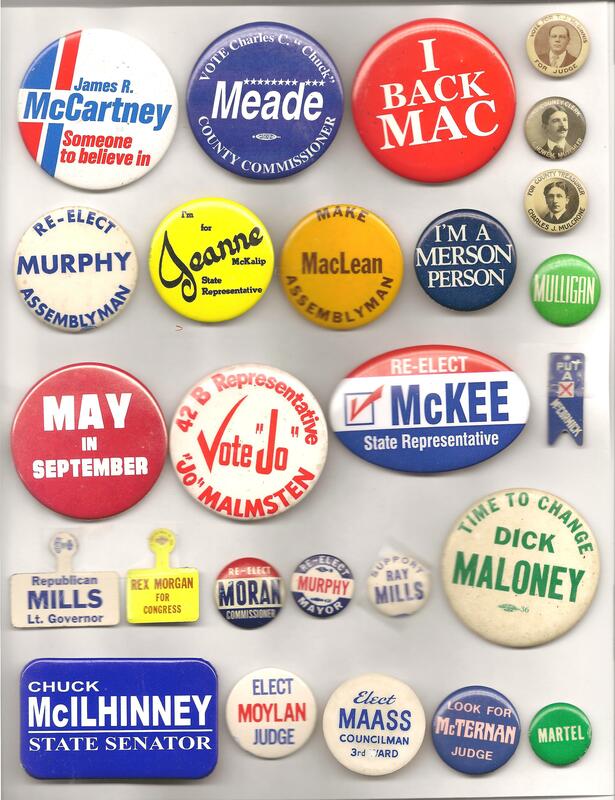 “Vote Macheras Senator” (p. 1, row 6) — George P. Macheras was a five-time unsuccessful candidate for Massachusetts state senator from the First Middlesex District (Lowell). In 1962, ’64, and ’66 he ran in the Democratic primary; in 1968 he ran as an Independent; in 1970 he was the Republican nominee. Ken, Just sat down and went thru some of your mayor pins pictured on page 3 above. I think I can help you with a few of them. 4. McMorrow, for mayor: John P. McMorrow, 1959, Boston, Mass. 6. Moylan for mayor: Cornelius A. Moylan, 1945, Hartford, Connecticut. page 4, row 1: Mutchler is George Howell Mutchler Demo. Warren Co. NJ clerk elected in 1910, 1915 and possibly 1920.